It’s a statistic that may shock you: Approximately 1.6 million youth across the country face homelessness each year. Particularly shocking is that approximately 40 percent of these homeless youth identify as lesbian, gay, bisexual, and transgender (LGBT), when compared to only 7 percent of the general population. Such a large number can be primarily attributed to family conflict over sexual orientation, gender identity, and expression which often results in youth running away from home or being forced out of their home by their families. With such a disproportionate representation among the homeless population, it’s important to understand the reasons why LGBT youth are experiencing homelessness and what we as a community can do to help eradicate this epidemic. Why is this important to LULAC, the nation’s oldest and largest Latino civil rights organization? Although it's hard to determine specific statistics, a study of New York City LGBT youth experiencing homelessness estimated that 26 percent of respondents were Latino. This translates to thousands of our Latino brothers and sisters who are experiencing hardship, increased risk of mental illness, sexual assault, and increased exposure to sexually transmitted infections. Throughout its long history, LULAC has defended the civil rights of Latinos and continues to advocate for their well-being—and this includes advocating for the LGBT Latino community. In 2006, LULAC started its first LGBT LULAC Council dedicated to fostering dialogue and understanding between the LGBT and Latino communities, and LULAC has continued its commitment by expanding the LGBT councils to 6 cities and collaborating with LGBT allies in 10 states to distribute over 10,000 pieces of LGBT Latino bilingual educational materials. In February, I joined 150 fellow LULAC National Board and LULAC Youth & Young Adult members to advocate for Latino issues on Capitol Hill in Washington, D.C., and part of our platform focused on speaking to congressional leaders about LGBT Latino youth experiencing homelessness. On behalf of the LULAC National Youth Board, I am proud to join people across the country on Wednesday, April 27, 2016 for the second annual #40toNoneDay, a national campaign from the True Colors Fund that focuses on raising awareness about LGBT youth homelessness. The goal of the campaign is to ultimately reduce the disproportionate percentage of youth experiencing homelessness who identify as LGBT from 40 percent to none. In order to do that, we must raise awareness about the issue and encourage everyone to take an active role in ending it. On this important day, we stand with service providers, advocacy organizations, elected officials, celebrities, LGBT youth, and community members to bring visibility to our fellow youth in need. How can you get involved with the #40toNone Campaign? Check out some ideas below to help us spread the word. 2. Take an “unselfie” and post it on your social media accounts. Visit the True Colors Fund for more information and ideas on how you can be involved. Jared Hernandez serves as the LULAC National Youth President. He first volunteered with LULAC Youth at the age of 14 in Galveston, Texas. Currently, he is a freshman studying political science at the University of North Texas. Check out more information on LULAC Youth by following @LULACYOUTH on Twitter. In 2009, the LULAC National Assembly passed an environmental justice resolution committing the nation's oldest and largest Latino civil rights organization to fight for access to clean water, air, and food. The resolution, called the Declaration of the Principles of Environmental Justice and Environmental Bill of Rights in Latino Communities in the United States, affirmed LULAC’s support to fight for policies that ensure that Latino communities are protected from nuclear testing and the extraction, production and disposal of toxic/hazardous wastes and poisons that threaten the fundamental right to clean air, land, water and food. LULAC has aggressively participated in various campaigns to protect the air, land, water, and food that are essential to our survival. These efforts have included providing testimony to the National Environmental Justice Advisory Council expressing support for the Clean Water Rule , signing on to a legal petition requesting that the U.S. Consumer Product Safety Commission ban certain classes of toxic flame retardant chemicals found in everyday household products, pushing to expand solar opportunities in states, and supporting standards to limit methane pollution by the oil and gas industry. LULAC has also engaged significantly with EPA Administrator Gina McCarthy on various issues, even holding a twitter town hall in 2015. In addition, LULAC has continued its grassroots education campaigns and has disseminated critical information to the Latino community on issues like toxic chamicals, climate change , and air pollution, among others. Despite all this work, as we enter the full swing of another contested presidential election, the media has once again largely painted the Latino community as single-issue voters who care only about immigration. This portrayal could not be further from the truth. Latinos have repeatedly indicated that issues like education, health care, the economy, and the environment are critically important. According to research on the topic of the environment, Latinos more than other Americans, see climate change as a consequence of human activity. In fact, this year the National Hispanic Leadership Agenda released its 2016 policy priorities report and included one of the strongest environmental planks in the history of the organization. The situation in Flint, Michigan is perhaps the latest example of the need for a sense of urgency to elevate environmental issues and advocacy in the Latino community. The water in Flint, Michigan is full of lead, a heavy metal known to be hazardous to humans and yet, many in that community have long been drinking the poisoned water. While, the full extent of the damage is yet to be understood, the impact on the lives of Latinos in Flint, however, is clearly visible. Sources on the ground report that some children have lost their hair and others have developed unexplained rashes. There are also accounts of pregnant women, who unaware of the contamination, continued drinking the water for months despite the known science that points to the harmful effects of lead on the development of unborn children. A non-responsive state government, problems with emergency water distribution, lack of bilingual material and governmental staff, all contributed to the scale of the water problem which stemmed from a poor decision by politicians to use toxic pipes that leaked lead (presumably as a way to save tax payer money) at the expense of the health of the residents of Flint, Michigan. Only now have the media, politicians, and federal agencies started looking more closely at what happened in Flint and who is ultimately responsible. But the real question is, how many more people have to be poisoned by contaminated water before our leaders take national action? How many more children have to lose their hair and develop skin rashes before Latinos elevate the environment as a critical issue warranting government accountability? • Half of all U.S. Latinos live in the country’s most polluted cities. • Although Latinos only account for about 16 percent of the labor force, they account for 43 percent of ground/maintenance and construction workers and up to 75 percent of agricultural field occupations that expose workers. • States such as California, Nevada, Colorado, New Mexico and Texas—where the majority of Latinos live—are experiencing more intense and frequent heat waves and drought. • Latinos want action to slow the damage and protect nature not just for them but for future generations. The time has come to link the fight for civil rights with the fight for clean air, water, and food. 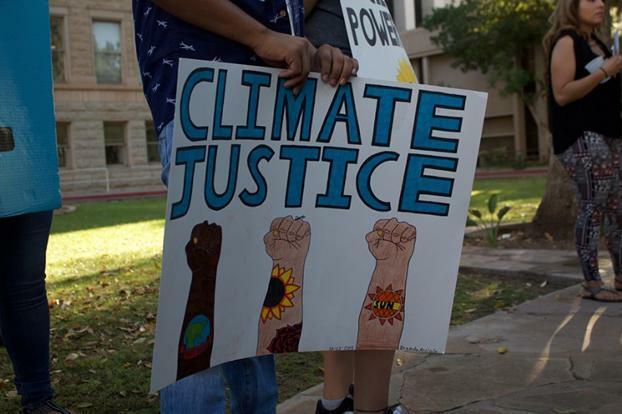 Achieving environmental justice for our community means opposing efforts to undermine or repeal bedrock environmental laws, including the Clean Air Act, Clean Water Act, and National Environmental Policy Act. It means supporting strong enforcement of existing public health and environmental laws, including civil rights laws such as Title VI of the Civil Rights Act, expanding research on the long-term impacts of pollutants, pushing for green jobs, and increasing STEM programs that prepare Latinos for opportunities in the energy sector. Most importantly, achieving environmental justice requires all Latinos to hold our government accountable for the meaningful engagement of our community in the development, implementation, and enforcement of environmental laws, regulations, and policies at the local, state, and federal level. This is the challenge before the Latino community, and the upcoming presidential election will provide Latinos the most powerful tool they have at their disposal—their vote and the ballot box.